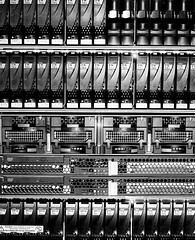 All-flash IBM V7000 smashes Oracle/Sun ZFS box • The Register – Carpet Bomberz Inc.
What would happen if we replaced those 16 disk-based V7000s with all-flash V7000s? Each of the disk-based ones delivered 32,502.7 IOPS. Let’s substitute them with 16 all-flash V7000s, like the one above, and, extrapolate linearly; we would get 1,927,877.4 SPC-1 IOPS – nearly 2 million IOPS. Come on IBM: go for it. via All-flash IBM V7000 smashes Oracle/Sun ZFS box • The Register. That’s right, IBM is understanding the Flash-based SSD SAN market and is making some benchmark systems to help market its disk arrays. Finally we’re seeing some best case scenarios for these high end throughput monsters. It’s entirely possible to create a 2Million IOPS storage SAN. You just have to assemble the correct components and optimize your storage controllers. What was once a theoretical maximum throughput (1M IOPs) is now achievable without anything more than a purchase order and an account representative from IBM Global Services. It’s not cheap, not by a longshot but your Big Data project or OLAP with Dashboard may just see orders of magnitude increases in speed. It’s all just a matter of money. And probably some tweaking via an IBM consultant as well (touche). Granted that IBM doesn’t have this as a shipping product isn’t really the point. On paper what can be achieved by mixing matching enterprise storage appliances and disk arrays and software controllers is beyond what any other company is selling IS the point. There’s a goldmine to be had if anyone outside of a high frequency trading skunkworks just shares a little bit of in-house knowledge product familiarity. No doubt it’s not just the network connections that make things faster it is the IOPs that will out no matter what. Write vs. Read and latency will always trump the fastest access to an updated price in my book. But I don’t work for a high-frequency trading skunkworks either, I’m not privy to the demands made upon those engineers and consultants. But still we are now in the best, boldest time yet of nearly too much speed on the storage front. Only thing holding us back is the network access times.